As always, this is not a book report. Rather, it is an opportunity to discuss some ideas that stuck with me while reading “Sons of the Profits” by William Speidel. Long before I claimed an apartment in West Seattle… Long before I moved into my dorm in Edmond… Long before my family settled on the plains of Oklahoma, these lands were cherished, cared for, and home to a proud race of people. 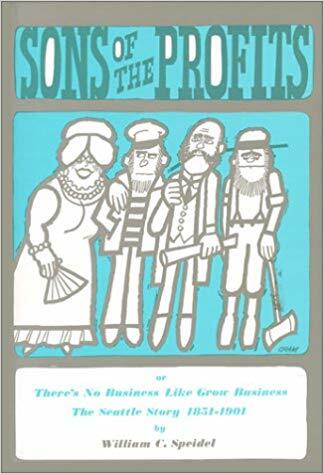 It is these people who were on my mind while reading “Sons of the Profits.” While the book is primarily focused on the tribes occupying the Seattle area, it wasn’t hard for me to think of all the people who lived in places I have ever called home. I imagined their joy, struggles, and pride. I thought about the coming wave of Europeans who would claim these lands as their own. My mind fixated on the bloodshed, treaties that were never honored, and promises never kept. Rarely in human history has such a fate been visited upon a people like the hell that made its presence known on the doorsteps of those who once lived in all the places I have ever called home. The railroad was the economic engine that first tied this country together. As a network of rail was laid from east to west, communities of all sizes fought for their chance at a stop. With trains, there was a chance at commerce, trade, and opportunities at larger markets. Without a train, communities existed on a map, but nothing more than that. I can only imagine what this point in history looked like but reading of the war of rail between Seattle and Tacoma painted a vivid picture of how important the railroad was to a city. It also gave me insight into a rivalry that lasts to this day. To read this book is to come to terms with the importance of women and water to a community. Removing Indians freed up land. Coaxing the railroad brought jobs. Women and water meant life for generations to come. Human history didn’t always happen in this order, but for municipalities occupying the western United States, this seems to be the order of things over and over again. Of course, each step carries some level of sin that can never be forgiven. For many, this is beside the point, but for those of us provided with the opportunity at hindsight, it should matter a whole lot.